Dr. Biamonte is a world recognized authority for treating candida and digestive issues. He is a published author and doctor to celebrities and all kinds of public figures! ​Dr. Biamonte utilizes EXCLUSIVE Blood Chemistry Software that has revolutionized the way practitioner's understand lab tests and prioritize their patient's treatment. Never before, have we been able use the "Brain of a Computer" to study blood work, mineral tests and many other lab tests to determine exactly where your body is imbalanced. Learn more about the software here. Experts In Complete Candida Elimination! We are World Recognized experts in complete candida elimination through our proprietary treatment program, which has been developed and tested over our 30-year practice. Through our unique combination of laboratory testing, candida diet plans, vitamins and supplements, we have the solution to remove candida from your system and help you achieve a full body overhaul. We also help people with many other issues such as: Leaky gut, toxic metals, hormone irregularities, constipation, adrenal fatigue, thyroid imbalances, and diabetes. According to recent surveys, our method has a success rate of better than 90%. Much of the success of this approach is not in what we do, but when we do it, and what we DO NOT DO! 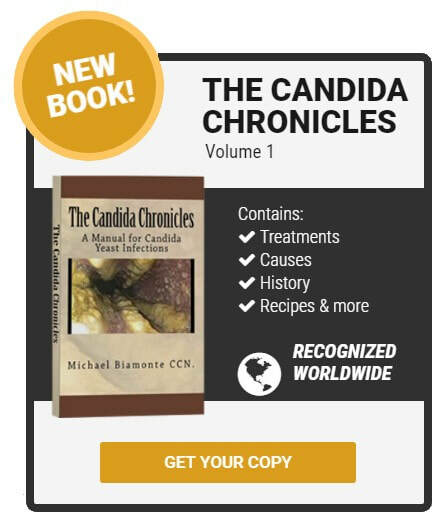 Dr. Biamonte is a World Authority on the treatment and elimination of Candida. You can order his book on Amazon.com or request his FREE video by entering your name and email.